When and Where was the he Born? Nothing is known of the Venerable Bede’s parentage. He was taken to the monastery of St. Peter at Wearmouth at the age of 7 by the Abbott, St. Benedict Biscop. Educated by Monks at Wearmouth and Jarrow. Famous for popularising a new dating system, which began events from the birth of Christ. (AD). 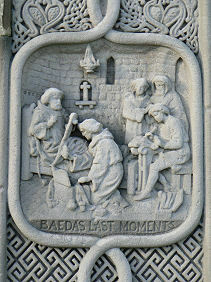 680: Bede entered St. Peter’s Monastery at Monkwearmouth at the age of seven. 686: The Venerable Bede went to Jarrow, where he spent much of the rest of his life. 703: He was ordained as a priest. 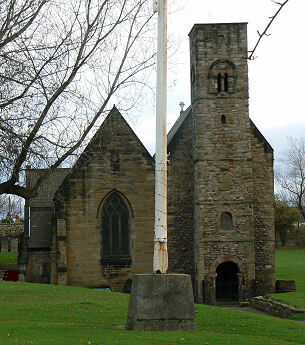 Associated with the Monastery of St. Paul at Jarrow. Taught Greek, Latin Hebrew and Theology. He spent much of his time in prayer and writing. He wrote works on the lives of five abbots and 114 saints as well as several biblical commentaries, hymns, verses and books. He also wrote works on astronomy, medicine, physical science and grammar. He made several commentaries on the Old and New Testaments and translated the Gospel of St. John into Anglo-Saxon just before his death. (836): The Synod of Aachen posthumously awarded him the title “Venerable”. (1899): Bede was Canonised: (made a Saint). 725: “De Temporum Ratione” about the reckoning of the date for Easter. 731: “Historia Ecclesiastica Gentis Anglorum” (Ecclesiastical History of the English People). (This work earned him the title of the “Father of English History”). Various: (Bede wrote many other works particularly on books of the Bible throughout his life such as “On the Revelation of St. John” in three volumes. These are listed at the back of “Anglorum”). (Introduced the custom of dating events from the birth of Christ). 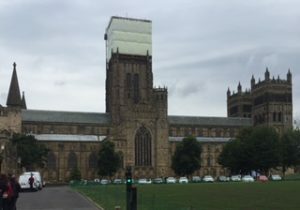 Originally at Jarrow but his bones were moved in the Eleventh Century to the Galilee Porch, Durham Cathedral, Durham, County Durham, England. 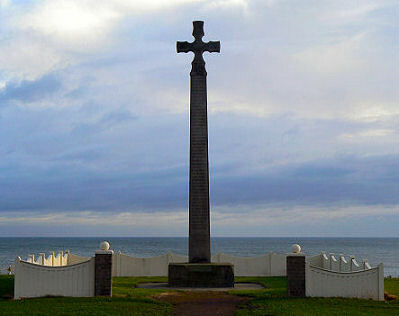 Statue to Bede on the seafront at Roker.